“age spots” and discolorations, and avoiding skin cancer, then you must take steps to protect yourself from the sun’s ultraviolet (UV) radiation. After a long, dark winter, we all yearn to shed the sweatpants and sweaters and get outside into the sunshine. Just remember to protect your skin from harmful rays prior to dashing outdoors. It’s important to do this consistently. Getting a sunburn (defined as pinkness or redness from sun exposure – it doesn’t have to blister or peel to qualify), just once every 2 years, can triple your risk of melanoma skin cancer. And for those who are already using skin-lightening creams (hydroquinone) to reduce prior sun damage, an entire month of cream application can be reversed in a single 15 minute, unprotected sun exposure. 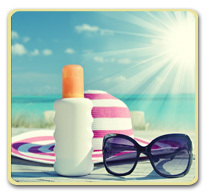 Use high SPF, broad-spectrum sunscreens (>30 SPF). There are two kinds of sunscreens – chemical (which use a scattering mechanism to reduce UV exposure – benzophenone and octinoxate) and physical barriers (sun blocks, which usually contain one of two metals: zinc oxide or titanium dioxide, do not allow the rays to penetrate). Whenever possible, choose the block type of sun screen as it is more effective. These days there are many tinted block options that reduce the old fashioned “white lifeguard nose” appearance. Remember that the sun reflects off of water and snow, and UV rays are stronger at higher altitudes. Reflected rays can actually burn you under your chin, so don’t forget to put sunscreen there. Remember to cover your scalp and ears – visors do not provide the kind of coverage that full hats can. Use sunblock on the ears if they remain uncovered. Ear skin is high risk for skin cancers because we often neglect to put sunscreen on them. I’ll see you around in my white, SPF 50 turtleneck with a big hat and sunglasses and zinc-face this summer!